In 2006, King County Housing Authority (KCHA) awarded CTS a 3-year, On-Call Civil Engineering Services Contract with a $350,000 limit. Then in 2009, KCHA again selected CTS for a new Term Contract for Consultant Services for a period of 6 years with a contract value of $500,000. During these two contracts, CTS has to date completed over 100 individual task orders covering geographical King County and involving storm drainage, parking lots, facility amenities, ALTA surveys, topographic surveys, short plats, foundation underpinning, subdivisions, erosion repairs, construction staking, as-built surveys, record drawings, utility surveys, sanitary sewer, and water supply. The deliverables have included reports, preliminary designs construction documents, cost estimates, permitting, and construction administration. All task orders involved KCHA multi-family housing facilities. CTS coordinated various permits with King County DDES, and the cities of Bellevue, Tukwila, Kent, Auburn, Renton, Redmond, Newcastle, Des Moines, Kirkland, Seattle, and Issaquah. CTS’s most recent task assignments, completed in 2013, involved conducting 4 ALTA surveys for properties that were under consideration for purchase by the housing authority. 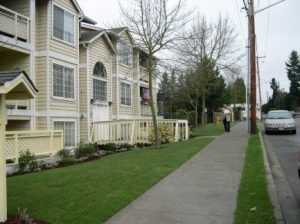 These properties were located at Bellevue Manor, Bellevue; Northwood Square, Auburn; Vashon Terrace, Vashon Island; and Patricia Harris Apartments, Kirkland.